When the power to Brutus, the only Bucyrus-Erie 1850-B ever built, was shut off in 1974, no one was thinking in terms of trying to preserve its legacy. However, thanks to machinery enthusiasts of every age and from every walk of life, that is what happened with the conservation of the machine. To add to that mystique, Classic Construction Models will be producing a one time, limited edition model of this machine from brass in precision 1:87 scale that promises to capture its power and unique personality. If the sign of a truly great model is that it is so detailed that every time you look at it you notice something new, this model will live up to that test. So, in true CCM fashion, all the stops have been pulled to recreate this legendary machine. Modeled from hundreds of meticulously reproduced and individually hand-crafted parts, the level of detail achieved places this model at the top of its class. At first glance, the overall size of this model in such a small scale gives a sense of the enormous size of Brutus. Given a full-size pickup at this scale would measure approximately 2.5” long, the width (8”), length (30” with the bucket extended) and height (a full 22” to the top of the boom) makes its size even more impressive. In June 1962, the first of what would total 150 railcars began delivering components of the only Bucyrus-Erie 1850-B ever constructed to Pittsburg & Midway’s Mine 19 near Hallowell, Kansas. Brutus, as it was nicknamed, was constructed over the course of the next 11 months by a 52-man crew working tirelessly to erect the massive electric stripping shovel. Standing 160 feet tall and weighing an impressive 11 million pounds with ballast, Brutus was the second largest electric mining shovel to be put to work at that time. The list of specifications on this legendary machine is at best, hard to process. For example, the boom would reach from the goal line of a football field to the 50-yard line and while shorter, the dipper stick is just under 30 yards long. This configuration allowed digging to 69 feet below grade with a dump radius of 150 feet and the ability to pile spoils up to 100 feet high. With a bucket capacity of 90 cubic yards and 150 tons, Brutus could fill three railcars with overburden in a single pass. The counterweight ballast tanks on the back side of the machine weighed in at 1.7 million pounds. Power for this gigantic workhorse was supplied through a 7,200 volt 3 phase AC electric ‘umbilical cord’ providing a maximum 1200 amps. Two massive 3,500 HP electric motors ran the 13 DC generators, with each controlling one of the 13 DC motors on the machine. The main hoist was controlled by eight synchronous 500 HP motors and stored 800 feet of 3½” diameter wire rope, weighing 25 pounds per foot, on each side of its 8-foot diameter drum. Three 750 HP swing motors and two 500 HP crowd motors complete the functionality of a work cycle, and a regenerative braking system was utilized during the downward movement of the dipper to improve energy efficiency. Brutus stands on 4 trucks, each consisting of a pair of crawler tracks. These crawlers each measure 34’ in length, 5.5’ wide, and 6 feet tall, with an overall width of 16’ per truck. Individual track pads on these crawlers weighed in at just over one ton. Each truck, powered by a 250 HP electric motor, propelled this machine at a top speed of .22 miles per hour. While working, Brutus required a 3-man team to keep production running smoothly. This included the operator, a ground man, and an oiler. The operator controlled all functions related to digging – including the swing and bucket operation – while the ground man moved the machine forward and reverse. Steering was accomplished using hydraulically driven steering arms and controlled by the machine’s ground man who also kept the shovel level while traveling by using the hydraulic leveling jacks on each crawler assembly. In keeping with the scale of the machine, these jacks could adjust the crawler to machine height by 5 ½ feet. The oiler was in constant motion as he had to keep all moving parts on the machine oiled and greased while it was operating. Although designed with an expected life of 25 years, Brutus was only on the job from its first cut in May of 1963 until its final pass in April 1974. Despite being mechanically sound, a depleted supply of coal combined with declining coal prices made it economically unfeasible to continue operation. Given the 7,200 volts of electricity required to operate, it should come as no surprise that in its final month of work it rang up a power bill of $27,000 – which is more than $130,000 at current rates. Deemed too big to move and too expensive to dismantle, Brutus was stripped of its electrical and auxiliary equipment and left in the once prosperous Mine 19. 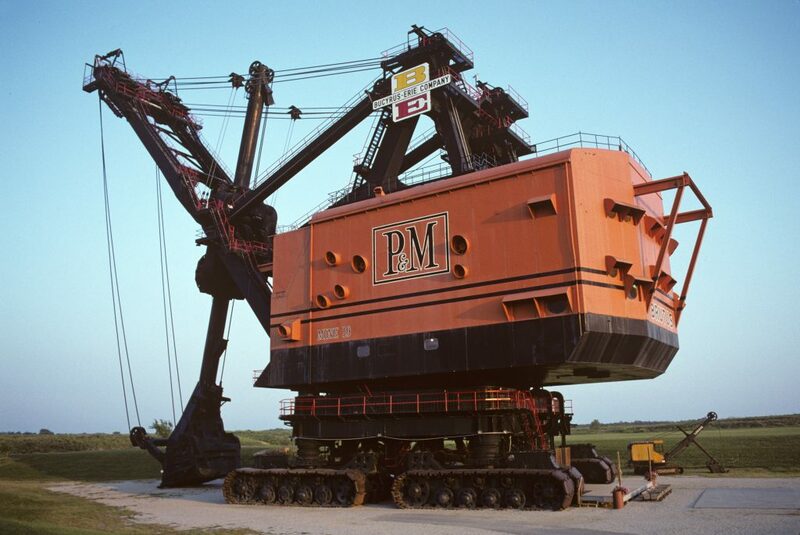 In 1984, the Pittsburg & Midway Coal Mining Company donated the machine to Big Brutus, Inc., a non-profit organization that took responsibility to restore it and make it available for viewing. Today, Brutus, the only Bucyrus-Erie 1850-B ever produced, is the monumental centerpiece of the mining museum in West Mineral, Kansas. As a tribute to the technological & engineering advancements it represents, it was designated as a Regional Historic Mechanical Engineering Landmark by the American Society of Mechanical Engineers in September 1987. A number of changes were made to Brutus during its working life which complicated exactly how it would be configured. However, in the end it was decided to recreate the shovel as it appeared on its last working day to help ensure the absolute accuracy of the model while making it instantly recognizable to as many people as possible. The model stands on four crawler units located at the corners of the base frame. Each crawler unit is made up by a pair of tracks composed from individually linked, free-rolling track pads. Functioning drive and take-up tumblers located at each end of the track, as well as rollers on both the upper and lower crawler frame provided a smooth-rolling track. Four accurately replicated, large diameter hydraulic pistons support the weight of the model and connect the crawler units to the base frame. Though modelled at a fixed height, these hydraulic cylinders depict the leveling capabilities of this machine. The roller circle connects the base to the revolving frame through the use of individual rollers which allow the model to swing exactly as the machine during its working life. Double twin hoist ropes pass in a single lead from the drum over large boom point sheaves to the dipper. Both ends of the rope are attached to the drum and the bights are passed around equalizing sheaves at each side of the dipper. This arrangement was utilized on the machine to steady the dipper in the bank while digging and has been accurately portrayed at scale. Self-locking hoist drums allow for the recreation of a work cycle and make it possible to position the shovel in an accurate working position when being displayed. The dipper handle is extended or retracted by a positive rope crowd. The double twin crowd ropes pass from the crowd drums over large diameter sheaves at the saddle block. Two retract ropes are used with one end of each rope attached to the crowd drum while the other end is tied to a take-up device which can be independently controlled. The A-Frame provides support for the boom and is pin connected to the revolving frame in both the front and back and is supported at the rear by two safety cables for each leg. The boom is comprised of both an upper and lower boom sections. The lower boom section, built in a tapered configuration with widespread boom feet, is tied to the top of the A-Frame by struts. The upper boom is pinned to the lower boom section just above the shipper shaft, and supported through a series of bridge strands which connect to the top of the A-Frame. Boom machinery on this model includes the saddle block and crowd rope sheaves which are located at the junction of the upper and lower boom sections. The saddle block guides the tubular dipper handle and transmits lateral swing load to the lower boom section. Additional detailing modelled on the boom and A-Frame include walkways, stairs & platforms, maintenance ladders, hand rails and safety cages, and lights which were essential for the nighttime operation of Brutus. Even a service crane, which was used for maintenance work, has been portrayed at the boom point. The cylindrical dipper handle on this model measures 12.5” in length. The dipper connection is hand-soldered to the handle on the front end, while the crowd sheaves are securely attached to the other end. Anchors for the retract ropes and dipper trip machinery are located under the handle and back of the dipper to protect them against damage. The dipper is carefully detailed and features a functional dipper door. The fully detailed operator’s cab is accessible through a sliding door and includes the accurately portrayed master controls for hoist, swing, and crowd which were grouped appropriately for operation by one man. Cab windows are tinted to reduce glare and heat, and the specialized windshield wiper utilized on Brutus has been replicated at scale. The house on Brutus covers the entire rotating frame and is modelled and detailed at the appropriate thickness from etched sheet brass. Exhaust ventilation ports have been included which were essential to insure adequate air circulation, preventing hot spots within the house during operation. Even pick points from the original construction of the machine have been precisely replicated to enhance the authenticity. Finishing details, such as era appropriate Bucyrus-Erie paint and Pittsburg & Midway markings set this model apart as a true museum-quality work of art. This legendary machine is now destined to be replicated as one of our legendary models in a single limited edition of individually serial numbered models. We hope you take advantage of this one-time opportunity to add this exemplary, all brass model in precision 1:87 scale to your collection. Bucyrus-Erie 1850-B “Brutus” korea? China?